Inspired by Celebs, Made for SL! InspirationSL Reopens its doors on June 19th at 8am SLT to give you DAVID BOWIE! Inspiration is back, and this time we've got something REALLY special up our sleeves for you! This round, we're heading straight to Mars, with our favourite Starman... drum roll please... David Bowie! The king of glam rock, androgyny, and ever changing style, David Bowie was totally unique. He gave us groundbreaking music, unforgettable lyrics and some amazing films! With such a huge career to take inspiration from, there's bound to be something for everyone this round. 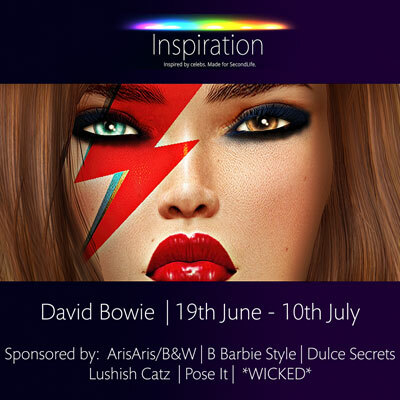 From hair, to make-up, to poses, to clothes, the Bowie round is NOT to be missed! Also, don't forget! Every 100th person to visit the event will receive a designer hamper containing 3 designer items from that round! What are you waiting for? Make sure to mark InspirationSL in your calendars today! Sunday 19th June, 2016, 8am SLT!